The great flavors of spaghetti without all the calories. 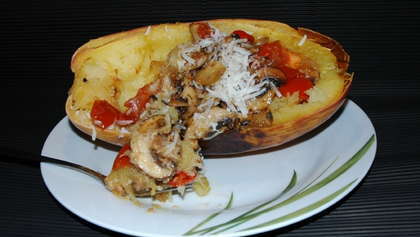 Pierce spaghetti squash all over with a fork. Microwave on high for 10-12 minutes until soft to the touch. Remove from microwave and allow cooling enough to handle. Slice squash in half lengthwise. Scoop out the seeds and pulp placing in the garbage. Scoop remaining "spaghetti strands" into a bowl. Meanwhile, in a large skillet, sauté onion in olive oil until soft and fragrant. Add peppers and continue to cook until slightly soft. Add the squash, olives, and black beans to the skillet and stir until heated through. Scoop mixture back into the squash rind or into a serving dish. Sprinkle with feta or goat cheese.